Hide the gold and silver, and lock up your able-bodied youths (who will be enslaved) and maidens (who will be… well you know), here come the Vikings with their Land-waster banner. My banner is based on a sail design from a second-hand souvenir dragon ship , which was made in Norway or Denmark. 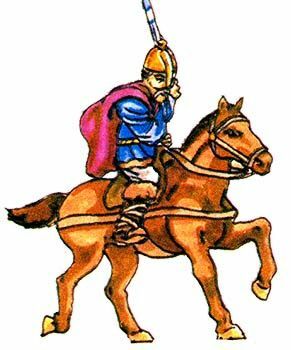 I thought the three armies that fought for England’s crown in 1066 (Vikings, Anglo-Saxons, and Normans) might make a nice set for wargaming. 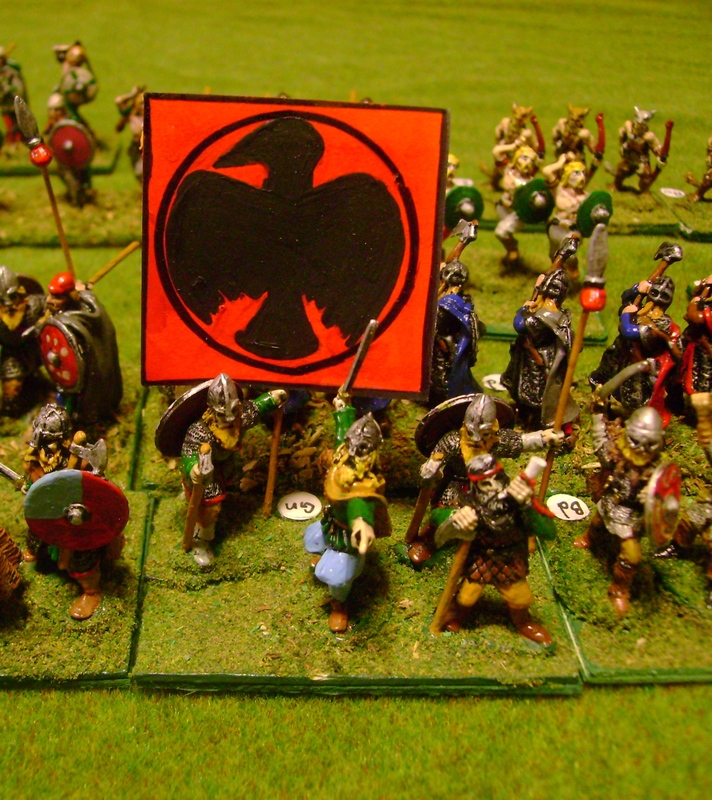 The Vikings are the first set I’ll post, and the Anglo-Saxons and Normans will come later. I made about 1/2 of the figures involved in a set of Prince August molds, and another 1/4 or so are conversions of other miniatures, with maybe the last 1/4 being factory-ready. Of course I painted them all, with varying degrees of success. Everyone knows the vikings were a horrible lot that delighted in slaughter and mayhem. Listen to some Amon Amarth and you get the idea, right? In all fairness the Northmen weren’t all about blood eagles and berserking. “Viking” means something akin to pirate or raider, so they don’t represent medieval Scandinavian culture as a whole, just the darkest, most violent side, as Sean Bean’s clan and later the Border Rievers were to Scottish society. Egil’s Saga is probably a good thing to read to get an idea of how Vikings fit into their society. My army is a mix of Prince August castings, a few Grenadier and Ral Partha figures, and a bunch of figures that were packaged for the now out of print Revenge! wargame rules, and produced perhaps by Old Glory? 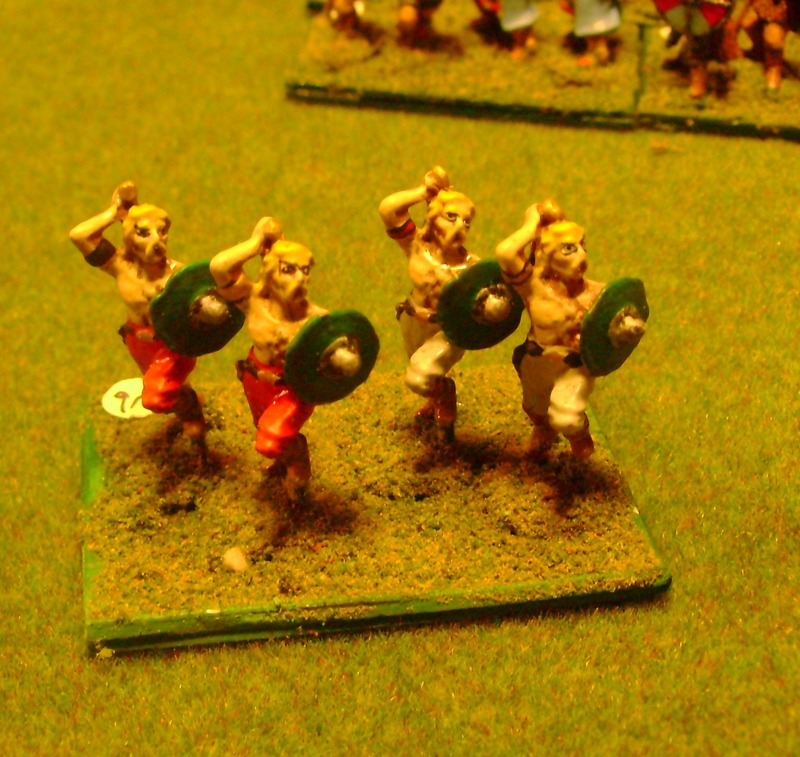 I used to have some fantasy barbarians based as Berserkers but decided I’d get more use of them in role-playing games, so the berserkers here are Prince August figures which I assume would really be Gauls. 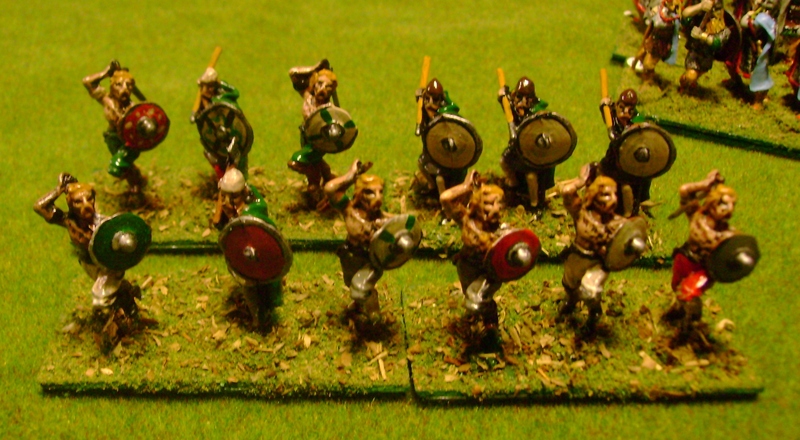 Some Irish troops to aid or oppose the Vikings. They are more Prince August figures, with shorter spears than the Anglo-Saxons to represent the javelins and darts that were so popular among them.